Bruce Munro's gorgeous fiber optic 'Field of Light' installation is inspired by the beautiful displays of flowers that burst forth from Australia's desert landscape. The UK-based lighting designer conceived of the installation years ago while driving across Stuart Highway on a road trip through Australia. Every night he would stop to rest at roadside campsite, where green grass and surreal sculptures struck a stark contrast to the surrounding red desert. Munro was fascinated by these oases, and how dormant desert seeds would burst into beautiful flowers when it rained. The idea stuck with Munro for years until he finally brought it to life in a brilliant installation at the Eden Project in Cornwall. Bruce Munro is a lighting designer with considerable experience in commercial, private and public installations. He is well known for adventurous sculptural light works and is well versed in all types of lighting, including fiber optics and LEDs. His newest installation at the Eden Project is set on a sloping grass roof full of clover between the Rainforest and Mediterranean Biomes. 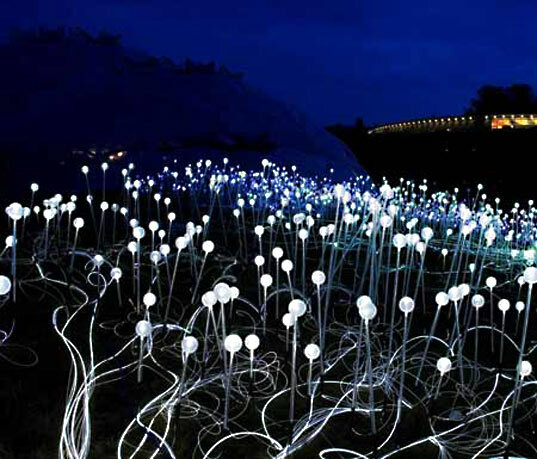 The Field of Light is made up of 6,000 acrylic stems fed with fiber optics and capped with glass spheres. Eleven external projectors power the 24,000 meters of fiber optic cable, which covers an area of 60 x 20 meters. The Eden Project is a well-known education center that encourages people to learn how to look after nature in a time of radical change. They offer educational programs, exhibits, events and workshops and especially focus on educating children and encouraging them to be part of nature. can you provide a ball park price for the fiber optics field of lights. I'm currently trying to price 3 gardens with the fiber optic sculptural grass appearance. Looks like an amazing installation! The lights remind me of the halifnat creatures out of 'the Moomins' series, too! 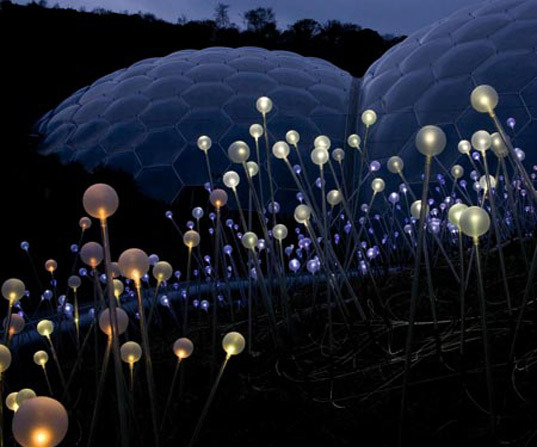 His fields of light installation at the Eden Project was set on a sloping grass roof full of clover between the Rainforest and Mediterranean Biomes. The Field of Light is made up of 6,000 acrylic stems fed with fiber optics and capped with glass spheres. Naturally, the Field of Light was best viewed at night after the sun has set, when the lights began to glow and the starry sky appeared to be reflected on the ground. The beautiful installation was on display from Winter into the Spring of 2009. As Munro remarks, "Field of Light, like a giant surreal camp-site banana, is an alien installation in the midst of nature. And like dry desert seeds lying in wait for the rain, the sculpture’s fiber optic stems lie dormant until darkness falls, and then under a blazing blanket of stars they flower with gentle rhythms of light. " "‘Field of Light’ is about the desert as much as the roadside campsites."